One of the main ingredients in South Indian traditional cooking is grated coconut. They are added to almost every dish including sambar, rasam, boiled vegetables, breakfast preparations, mid evening snacks etc. Of late, science has brought this nut into lime light, by talking about how coconut promotes weight gain, diabetes, heart diseases etc. • Many researchers have proved that fats present in coconut increases the good cholesterol (HDL) in the body. 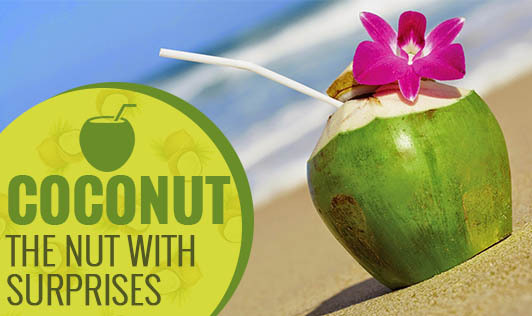 • Coconut when used regularly reduces irregular or painful menstruation. • Do not form harmful by-products when heated to normal cooking temperature like other vegetable oils. Our traditional foods and cooking methods have a lot of benefits to our health. However, our cooking today uses fewer traditional methods and so; we are unable to reap the benefits of many foods. The availability of processed foods, modern methods of cooking and convenience has taken away the goodness from traditional cooking forms. Grated coconut of about 2-3 tbsp/day isn't harmful. It can be added to any of your preparations. If you choose to have something more than your body requirement, it can turn out to be harmful. So, use foods in the right amounts to make sure you get the best out of it!